From the simplest teacup to the most elaborate sculpture, the Japanese find beauty in both everyday objects and objets d’art. Through Beauty in All Things: Japanese Art and Design, an exhibit currently showing at the Museum of Arts and Design (MAD), we can explore how Japanese aesthetics manifests itself in decorative pieces as well as functional items. The museum’s third-floor gallery is filled with contemporary examples of the traditional Japanese concepts of beauty, namely wabi-sabi, shizen, and datsuzoku. The notion that aging and imperfections bring out the beauty of an object drives wabi-sabi, where worn edges and cracks are badges of honor. Much of the pottery on display illustrates that theory. Shizen reflects the beauty of nature and the lack of pretense. Shape of Fish Baskets by Hiroshi Oe and Keisuke Mizuno’s porcelain Forbidden Flower just two examples, not only through the materials used, but the shape that the artwork takes. In a society bound by conformity and convention, the concept of datsuzoku, in which a new creativity evokes surprise, adds a touch of kawaii (Japanese cuteness) to the exhibit. Japanese design group Nendo used a roll of pleated paper left over from fashion icon Issey Miyake’s clothing production to create a chair with layers reminiscent of a cabbage. Chairs seem to be the highlights of the exhibit. Tea Ceremony Chair by Hiroki Takada is whimsical yet functional, and it at once eschews convention while paying homage to it. Takada’s chair is made of bamboo and takes the form of a chasen, the bamboo whisk used in the traditional Japanese tea ceremony. By employing a time-honored material to evoke a key component in a time-honored ritual, Takada produced an unconventional piece of furniture. 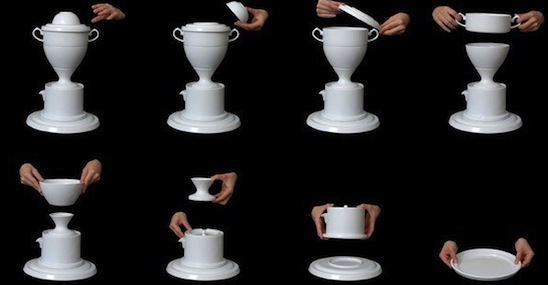 Another playful and functional work of art is Trophy Tableware by Emiko Oki. At first glance, the pure white ceramic object looks like a trophy. Disassembled, the pieces of the “trophy” become a table setting that includes a dinner plate, a bowl, and even a teapot. MAD arranged the exhibit to juxtapose what one might consider art and what one might consider practical articles, such as a ceramic vase and an intricately woven basket. Several materials are represented; in addition to ceramics and bamboo, items on display are made of textiles, wood, paper, glass, and metal – including one work made entirely of safety pins. Beauty in All Things shows that the traditions of Japanese aesthetics are still firmly rooted in the varying styles of contemporary artists and designers. 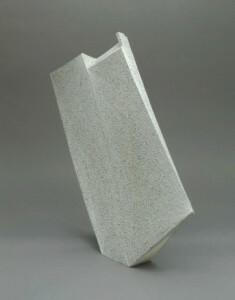 Emiko Oki, "Trophy Tableware," 2006. Beauty in All Things: Japanese Art and Design runs through June 3. The Museum of Arts and Design is located at 2 Columbus Circle. For more information, visit madmuseum.org. Next Next post: In the Noh: "Tokio Confidential"